I have a soft spot in my heart for Edgewood Park, Redwood City, California. A great place to hike and view the native California wildflowers. There's a dedicated group of volunteers, some great rangers, and artist Trevlyn Williams. Here's the result of my mini-obsession. 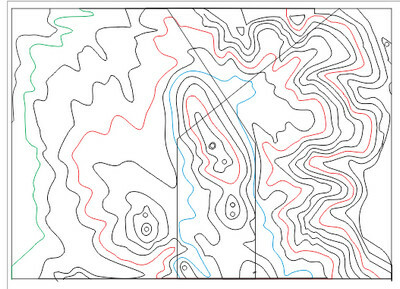 First I used CorelDraw to trace the contour lines from a topographic map. That was quite a pain. 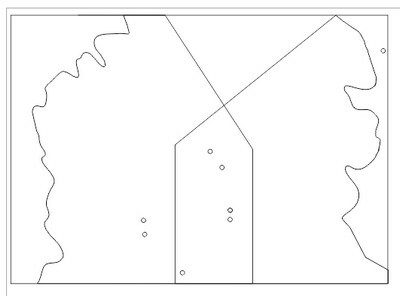 Here are all the contours in CorelDraw. Whew. Those little round holes are my idea for registration between the separate layers; when I glue the pieces up I'll put a wire through each hole. This is what one slide looks like. The diagonal lines were my idea of saving material. No need to have every slice go all the way through the "mountain." As long as each piece has some registration holes... bad idea. Oh well. 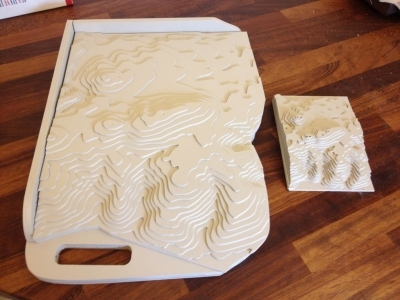 Then I cut those out of mat board with an Epilog Helix laser cutter and glued them together. A little bit of paint and voila! Edgewood park in the palm of my hand. I wrote up an Instructable about this. Of course, once it's in the computer it is a simple matter to scale it up! Here's the "portable" version of the model. There's an Instructable about this one too. 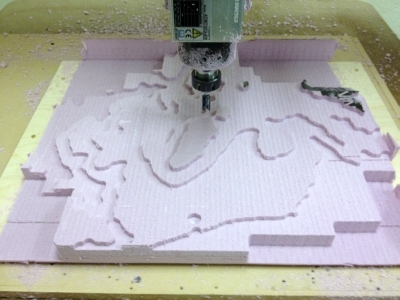 The ShopBot could make it smoother, if only I had a 3d model of the park... I used the Next Engine 3d scanner to create a computer mesh of the model. 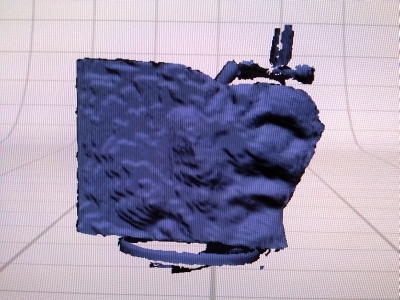 I used the smoothing features of the Next Engine software in an attempt to erase those heavy contour lines. I haven't really done much smoothing in this photo. 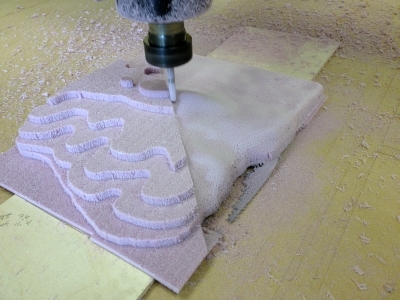 Import the model into V-Carve so it can create tool paths for the ShopBot to follow. Looks pretty good. 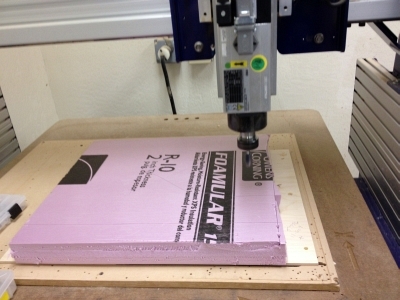 Here the ShopBot has finished the rough cut with a 1/2 inch end mill. 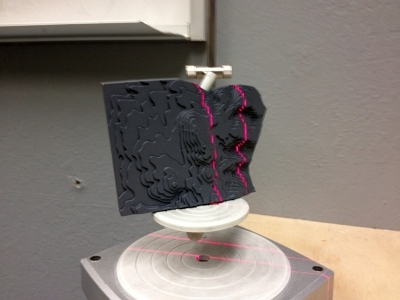 It's now working on the final raster cut with an 1/8 inch tapered ball nose. And this is the final product. 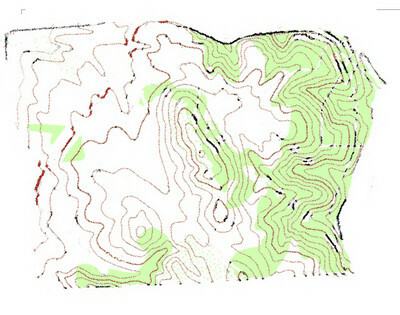 A true scale model of Edgewood park. The corner closest to the camera is the lower parking lot. Edgewood road runs along the right hand side and 280 runs along the back. 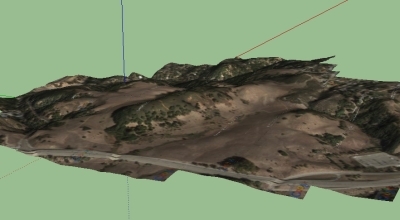 The camera is looking roughly south-west. Of course, there's an Instructable about this. 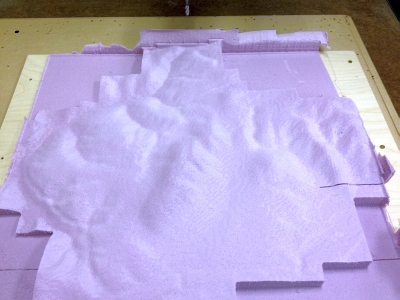 While showing off my model at TechShop Chris asked, "Did you get the terrain from Google Earth?" I didn't know you could... so here we go again. 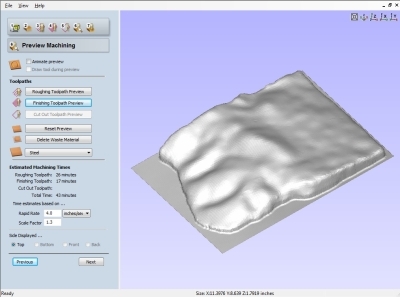 This is SketchUp8 - a wonderful program - with the terrain imported. That's 280 in the foreground; we're looking east. 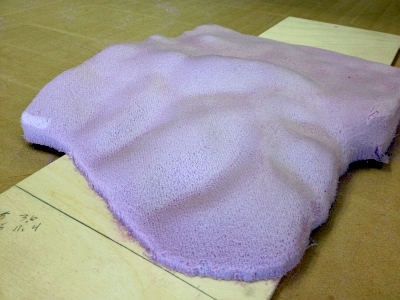 The pink house insulation is cheap and easy to cut. 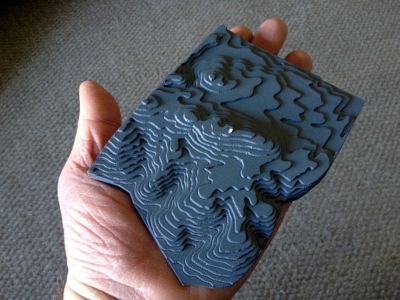 Here's it's on the ShopBot, ready to go. The rough cut is almost done. It took about 40 minutes. The final cut is about half way done. Took 3 hours total! It's about 15 inches on a side. The camera is looking directly east with 280 running across the foreground. You can see how much more detail is in this model. Look to the left and you can see the cut in the mountainside where Edgewood road runs.